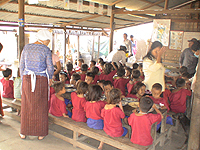 Elena Pistorio and Ariane Roulet Magides have travelled to the center of Pour un Sourire d’Enfant, PSE, in Stung Mean Chey, Phnom Penh in February 2008. 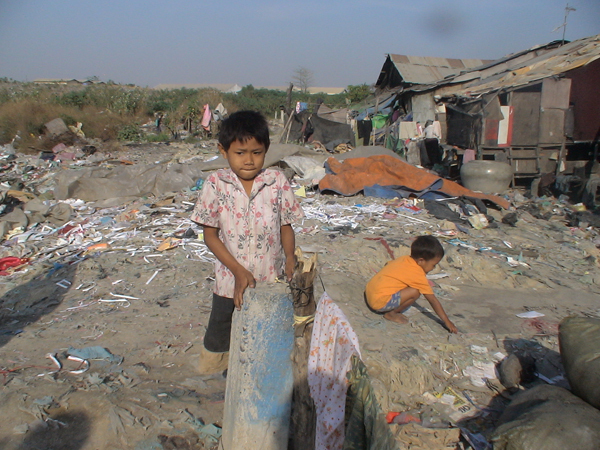 They visited both the center and the nearby dump of Stung Mean Chey. At the center, they met with the director of PSE, Mr. Pin Sarapich and the co-founder Marie-France de Pallières. They also toured the school and classrooms of the children that the Foundation supports. At the site of the dump, they witnessed once again, the deplorable conditions in which entire families work in the dump, searching for rubbish- plastic, aluminum, glass – for resale. 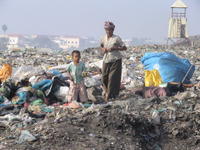 One family working around the clock at the dump can earn up to four dollars a day, but must pay for food, water, rental of land (3 USD per month) adjacent to the dump, and tools for trash picking. If one person in the family gets ill, they must get a loan to pay for medical care, and as banks will not lend to them they turn to usurious lenders who will charge them 20% interest. This starts a cycle of debt out of which they are unable to come out. Also, children and families are often victims of gangster groups who attack dump laborers and rob them of the little money they have. In addition, accidents on the dump account for two deaths per months. 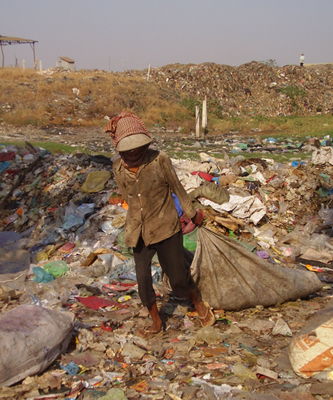 Dump laborers are run over by trucks or suffocated under trash unloaded by a truck. The sight of children sleeping on the rubbish, playing in rags in toxic waste and contaminated waters, and carrying bags bigger than themselves to fill with plastic waste was very difficult to bear, and stood as a desperate outcry for help. PSE represents hope for these families. Near the dump, PSE has set up a post at the border of the dump site where all children can get washed, have breakfast and lunch, clean drinking water, and receive medication; there is also a nursery where mothers can drop off their kids and tutoring is provided to older children who are not yet enrolled in school. The PSE Center is a few kilometers from the dump. At the Center are several Professional Schools, a dormitory for girls that are at risk of domestic abuse, and the “Centre de Rattrapage”, or School for Accelerated learning where children will study two academic years in one up to 12th grade, so that late starters can catch up and eventually pass their high school diploma. 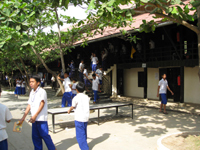 After their high school diploma they can either enroll in university or attend one of the 11 Professional Schools of PSE. The cleanliness and orderliness of the center is a welcome contrast to the dump site and the surroundings of a very poor suburb of Phnom Penh. The Center is very well taken care of and the children play in the basketball fields, courtyards, and volleyball fields during recreation. 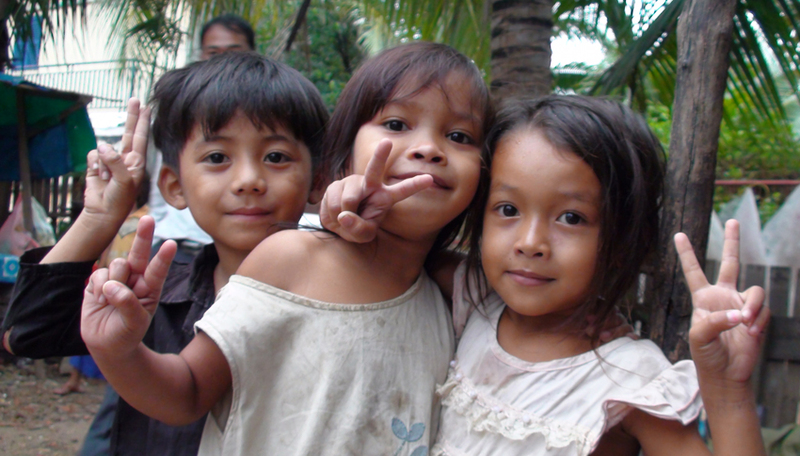 They are smiling and enthusiastic, both in the classrooms and outside. 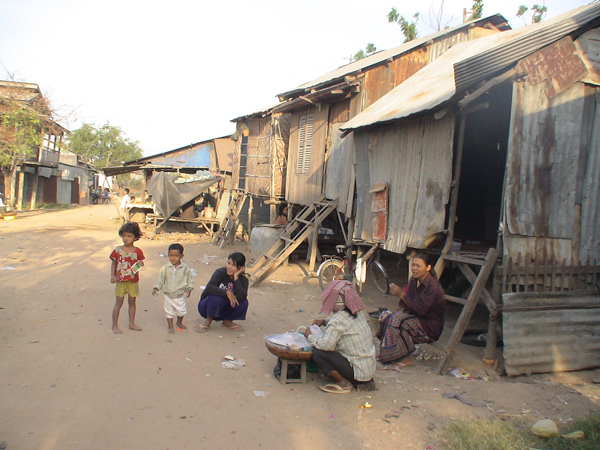 It is hard to believe that these children were former laborers at the dump and that every evening they to homes that are shacks skirting the dump. Thanks to PSE they are able to study and receive an education and escape the inhumane laboring at the dump. At the center they flourish and there is clearly a very warm and positive environment, despite the extremely difficult backgrounds of the children. Children arrive at the center at 6.30 am where they shower and have breakfast before going to school. Older students who are now at university work at the Center in the day and attend university classes in the evening. Impressed by the results of the children’s school attendance in the past year and the scrupulous running of the center, both in terms of administrative accountability and successful management of the schools, and conscious of the need to help more children from the dump receive an education, we have decided to increase the number of children that we support to 100 children. These children will receive a uniform, school supplies, two meals a day, will be able to attend school and their families will receive a portion of rice to compensate for the loss of income.